1. From the Home screen, tap App Store. 2. Tap Featured from the menu at the bottom. 3. Scroll to the bottom of the page and tap your Apple ID. If you don't see your Apple ID, tap Sign In and enter your information. Then tap your Apple ID. 4. Tap View Apple ID. 5. If prompted, enter your password and tap OK.
6. On the Account Settings screen, scroll down and tap Manage App Subscriptions. 7. Tap the subscription you want to manage, then choose a subscription category. 8. Use the options to manage your subscription. 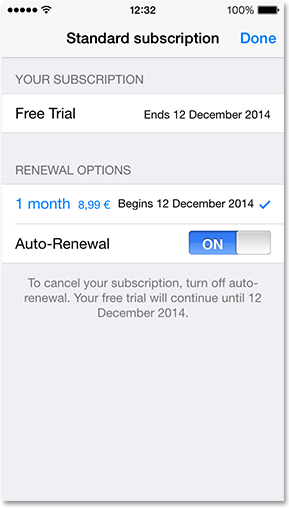 You can choose a different subscription period, or turn off Auto-Renewal. 2. If you're not signed in, go to Store > Sign In and enter your information. 3. Go to Store > View Account. If prompted, enter your password and then click View Account. 4. On the Account Information page, scroll to the Settings section. 5. Click Manage to the right of Subscriptions. 6. Choose the subscription you want to manage. 7. Use the options to manage your subscription. You can choose a different subscription period, or turn off Auto-Renewal. If you use Family Sharing, subscriptions will be charged to the family organizer's credit or debit card. To buy third-party subscriptions from your Apple TV, you need software version 5.0 or later. If you have further questions, please visit our FAQ page.